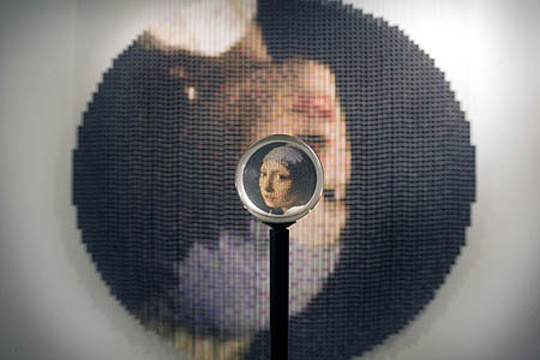 Artist Devorah Sperber's "After Vermeer 2 (The Girl with a Pearl Earring)" is an upside-down re-creation of the 17th-century Dutch artist's painting made of spools of colored thread. When viewed through a lens, the image is revealed. It's part of the exhibition "Thread" at Wood Street Galleries. Except for one mesmerizing work that reaches back to the 17th century and is worth a visit on its own, "Thread," at Wood Street Galleries, will be most appreciated by a Web-generation audience and those open-minded to the experience of the art that age group is producing. That isn't meant in any way as a dismissal of the exhibition because, while much of the expression is formally experimental, it affords a look into the present and future tense of art-making. Contemporary art is about change and, as a trip through the Museum of Modern Art in New York attests, what was once biting over time becomes commonplace, or even outdated. Since Impressionism challenged the superiority and rule of the academies in the last part of the 19th century, art has evolved through a staggering number of stylistic and ideological manifestations. That momentum continues, perhaps most radically driven now by computer technology and the World Wide Web. Michele Thursz, the show's guest curator, and the 12 participating artists or collectives are all young enough to have grown up with the Internet, says Murray Home, Wood Street curator. And their fluency with the digital world is evident, partially in the mechanisms they employ but also in the incorporation of customs and practices that those who spend little time online will be aware of. "The curatorial model of 'Thread,'" Thursz writes in an informative essay available to gallery visitors, "emulates the structure of a Web log." That will be more evident to some visitors than to others, and for the former will add a dimension of appreciation. For example, Ursula Endlicher's "WEBSITE WIGS" comprises bright multicolored wigs, some braided or with entangled brushes, anchored across a wall and connected with variously colored strands of "hair." It seems to be a blend of kitsch and feminist fashion concerns. But Thursz's statement, and a check of the artist's Web site, explains that the braids, strands, knots and other formal choices were determined by the "hyper-linked tree structure" of various Web sites, such as google.com or intel.com. "Each color-coded hair elastic represents a specific link on the Web site; a knot in the hair stands for 'secure https,' while 'loops' in the hairdo correspond to menu items on the Web site that link back to an upper level in the hierarchy." And more. It boggles the mind to consider the amount of time invested in this diagram, as well as the cross-threads of implications -- about communication, the structure and privileging of knowledge, inclusion and diversity -- that could ultimately be read in such mapping. If Endlicher's work may be seen as a deconstruction of the Web itself, Carlo Zanni and Anne-Marie Schleiner, in "Average Shoveler" and "PS2 Diaries," respectively, co-opt video games -- somewhat the way Roy Lichtenstein did comic strips -- as generic backgrounds for their political or personal narratives. But one doesn't have to be computer-savvy to relate to many of the displayed works. Horne says that one unifying theme of the exhibition is that these artists have used digital means to create art that was usually made of craft media. Craft has resurfaced recently, and perhaps not too surprisingly. When one considers that the Arts and Crafts Movement was generated at the turn of the 19th century in response to the Industrial Revolution, we're about due for a resurgence of interest in handicraft in reaction to the Cyber Revolution. This is most delightfully expressed by the collective Knitta, whose colorful, tactile fiber pieces envelop railings, pipes and the street post in front of the gallery. There is, notably, an element of subversion here, in the marking of public spaces, a benign graffiti. An exhibition currently at the Museum of Arts & Design in New York, "Radical Lace & Subversive Knitting," proclaims that "In the space of 10 years, knitting has emerged from the 'loving hands at home' hobbyist's den into museums and galleries worldwide." One of the artists included in that exhibition, Cat Mazza, is also at Wood Street with the curious "Knitoscope Testimonies," a (short) visual re-presentation of documentary-style interviews about sweatshop injustices as "knitted animation," an effect achieved via specially developed software. Standing outside of all of these is Devorah Sperber's "After Vermeer 2 (The Girl with a Pearl Earring)," a reproduction of the painting made popular by the 2003 movie, constructed of strung spools of colored thread. The large work -- 94 by 94 inches -- hangs upside down on a wall and at first appears to be abstract. However, when one looks into the stand-mounted lens in front of it, it is revealed to be a confoundingly respectable reproduction of the woman in the Dutch master's work. Vermeer's understanding of light, his knowledge of color and the role it plays in shadow and in creating dimension are simultaneously reduced and celebrated by being recast in a mass-produced and commercially available object. Further, in presentation, Sperber cleverly alludes to Vermeer's knowledge of and use of camera obscura technology (hotly contested after David Hockney's published claim, but the supposition had previously appeared in art texts). The appearance of the spools as overblown pixels anchors this work within the thesis of this au courant exhibition that reveals itself in proportion to time spent with it.